Promote and achieve excellence in all areas of school life. The school will be a place and a community where all children are happy and safe, where they can flourish and achieve their best in a caring, inclusive environment. 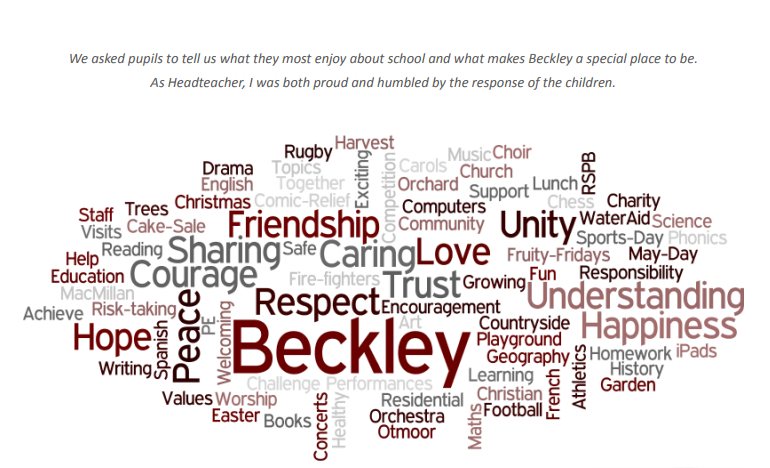 Beckley School is a welcoming, happy and safe place, with education as our core purpose. We are an inclusive school. We value and respect every member of our community as individuals. We are a church school, founded on the Christian values of Kindness, Honesty and Respect, together with wider understanding of responsibilities and rights. We take seriously our responsibility to offer the best possible opportunities to every child, including those with special needs or disabilities and pupils from disadvantaged backgrounds. Our Christian values underpin all aspects of school life, and provide clarity of purpose for all members of the school community. We explore and develop values informally and formally within school, so that children from every faith or background learn skills and behaviours that will guide their lives. Adults and children are encouraged to think about what kind of people we want to be and what kind of world we want to live in. Teaching and pastoral care promote a love of learning, physical and emotional well-being, and spiritual richness. In work and play we challenge and inspire all children and adults to be the best they can be. The following is a table of Christian values that the school focuses on each term. These values are referred to during Collective Worship and at other appropriate times during the day. The focus value is displayed and represented in every classroom and other communications, such as on our bi-weekly newsletters to parents and on the school’s website. Shared purpose enables us to build a cohesive team with high expectations and consistent practice. We will help children to be engaged learners, reflective thinkers and enthusiastic responsible participators in all that we can offer. Pupils will experience a broad and balanced curriculum which is well-taught and offers rich opportunities for them to learn and develop, to be challenged and motivated, to be creative, and to have fun. We aim for every child to achieve academically, and we believe that education should be understood by adults and pupils as life-enhancing and life-lasting. We strive for excellence in non-curricular activities, behaviours and attitudes. We will help children to discover their strengths and make the most of their talents, while also fostering their curiosity and perseverance in areas where they are less confident. Diversity will be celebrated and we will continue to respond to the differing needs of all children. They will make friends, learn to help each other and gain a meaningful understanding of community. Staff and governors of Beckley School will be professional and open to find pathways for the future development of the school even as the world of education continues to change. Our aim is that school will continue to provide an excellent education for local children, and will thrive at the heart of our community.